Can i use chicken cutlets for this recipe? I’ve made this recipe countless times and it’s ALWAYS delicious. I just realized I’ve been using artichokes marinated in oil and not water which could add more points. Do you use artichokes in water?? Where do you find them?? I don’t have a dish I can broil in. What would be the alternate temperature if I were to just bake it in the oven? Awesome! This was so easy…..like way too easy. It turned out perfect. I served it with the lentil salad. Used the lemon to finish it off which I think added the perfect touch. Made this for my husband and I tonight and it was very good! Definitely will make again! I love this recipe. But I have a really hard time trimming the fat off the thighs. How much fat should I take off? Should I only take off from the top? Or the bottom too? Your video about taking the skin off drumsticks was so helpful, do you have tips about removing the fat from things? This looks so yummy! Just wondering what kind of salad dressing I could use for a salad to go with it. Any suggestions? Can you grill this in place of broiling? It’s so hot to turn the oven on. Tomorrow is my lifetime weight watchers weigh in and today is my 25th wedding anniversary, so we went out last week for a big dinner and I made this at home for dinner tonight. It was sooooo good. I made it exactly as the recipe said and my entire family loved it. And I dont usually cook with feta and artichokes, so it was “fancy”. Lol. 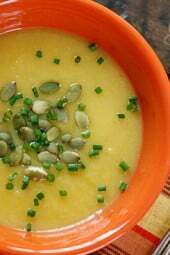 You are my go to site for WW recipes. Thanks for all your hard work! Well, if the husband asks for seconds, you know it’s good! This is probably our favorite recipe so far from you, Gina! Thanks so much. The flavor combination is perfection. We grilled it on a grill pan instead of broiling. I added the cheese once it came off the barbecue. I made a salad with bulgur, white beans and lots of fresh veggies (tomatoes, corn, zucchini, scallions) for a summer side. 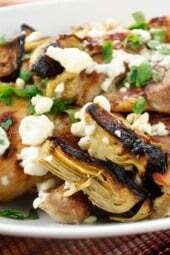 I absolutely love artichoke hearts and feta, and marinating the chicken in the artichoke heart liquid makes it superb! It comes together quickly and has been delicious each time I’ve made it. I had to check and make sure I hadn’t reviewed this already, I’ve made it that often! This is a new staple in our house! I ended up using a bigger jar of artichokes bc we love them so, and had the chicken marinate for a few hours. 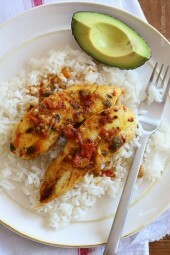 Such an easy dinner with amazing flavors–another winner from Gina! This is now one of my go-to recipes for the family or even company. 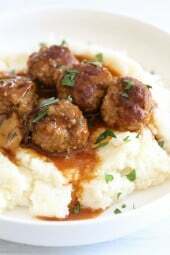 The flavors are great together and it is so easy to make. I add tons more garlic and incorporate it into the marinade. 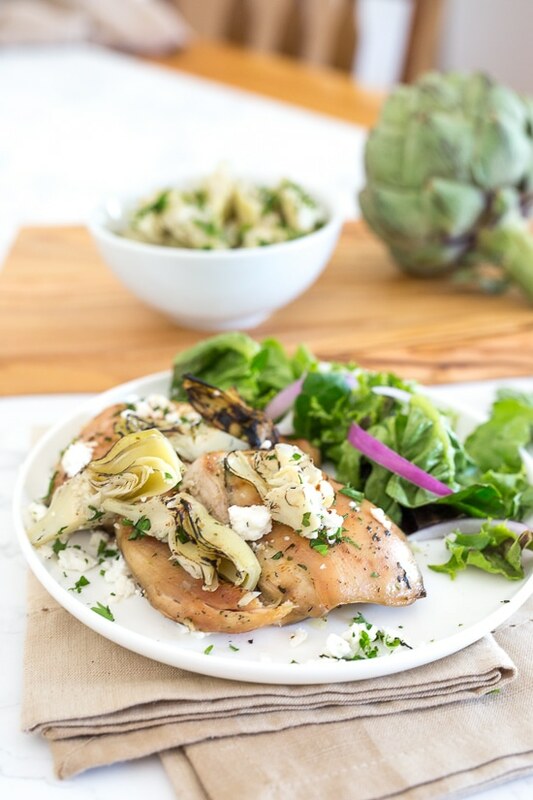 When making a large batch, I cook the chicken separately from the artichoke hearts. Another hit from Skinnytaste – thank you. So easy! And soooo tasty!! Thank you! This is so super easy and delicious! My go-to dinner on a busy night. One of my husband’s favorite meals. We have made this twice and loved it. Served it for guests who asked for the recipe. Went a bit heavy on the garlic and feta because we love them. Easy and really good. I guess I was confused by “broil” because 10 minutes on low broil and my thighs were still very raw. Does she mean to cook them on a grill? Anyway, I ended up putting them back in the oven at 400 for another 10 minutes, turned and cranked up the heat to 475 for another 10-15 minutes. Flavor was good though! How can I airfry this recipe? Ok, just wasn’t as flavorful as I thought it would be. This is terrific. I used extra garlic and feta and next time I might use a 12 oz jar of artichokes because my spouse loves them. It was a hit. Fantastic flavour. Easy to make. The lemon really adds to the medley of tastes. I made a Tripplebatch thinking there would be left overs but my family of 4 adults and 3 kids under 4 ate it all up. Next time I will use more feta You can never have enough feta. This was awesome! The amount of flavor the chicken picked up in just 20 minutes was phenomenal. Super easy and delicious. We will do it again and again. Thanks. This is SO good! I add lemon zest before cooking for an extra lemony flavor. I have made this twice now, and will make it regularly. Thank you, thank you! Love love love this reciepe! Made it tonight and was a winner all the way around ! Will make it again!!!!!!!! Ive looked through the comments and haven’t seen this asked so I guess I’m the only daft one ;-). I can only find artichokes marinated in oil. Your video seems to show much thinner liquid am I using the wrong thing? Not much of the oil drained off the dish before i put it in the pan, just concerned it will increase the fat substantially. We made it last night. It was quick and delicious. This is definitely one to repeat. Made this tonight. I love when a dish is this easy and tastes so good! Do y’all think you could make this in the crockpot? LOVE THIS DISH! SOOOOO easy to make and it has so much flavor! This was so easy and delicious!! Great combination of flavors and textures. Just made this tonight and it is GOOD! I added a little bit bigger jar of artichoke hearts and no lemon juice and VERY little salt and no pepper. The chicken was flavorful, tender and while I didn’t broil it I put the temp up to around 475 and cooked it a bit longer 12 to 13 minutes a side. 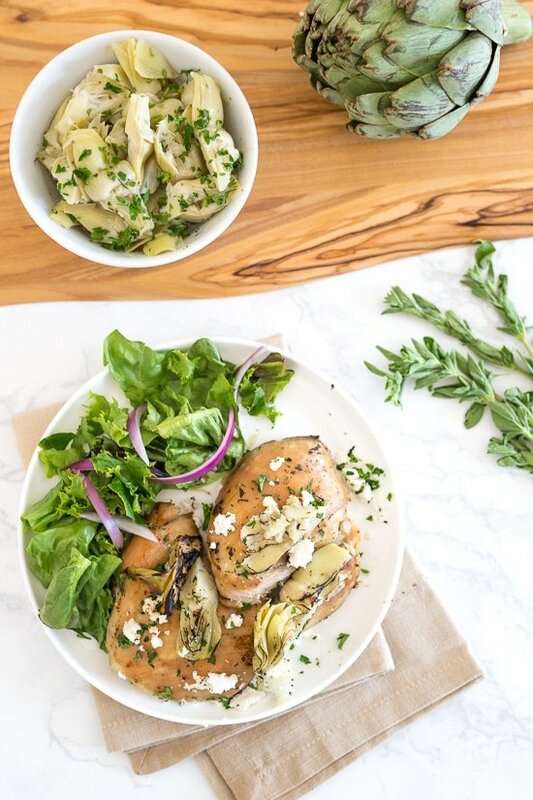 I like how the chicken juices seeped into the artichoke hearts and vice versa. I thought I would be put off by the burned blackened pieces of the chicken and artichoke hearts but NOPE VERY GOOD!!! We aren’t big fans of chicken thighs. Can I use breasts instead or will it not taste the same? 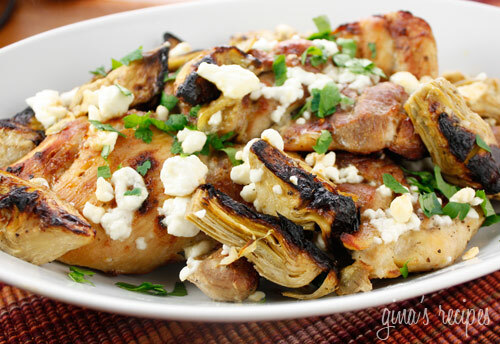 Pingback: Greek Chicken Thighs With Artichokes & Feta | Bomb Or Vom? This was amazing and easy for my husband to make. In his words, “This is a keeper put it on the menu again”. Just made this tonight! Got the marinated artichokes from Tradee Joe’s and it was delicious! Not sure if it was my oven or what but had to broil on high because low was just not cooking fast enough at all. Maybe gas vs electric makes a difference. Since my timing was off I just kept checking them until they looked golden. Made this tonight – it was a big hit! I added the garlic and oregano to the marinade rather than afterward, which worked out beautifully. The only complaint was not enough artichokes, so next time I may double them. Made this recipe tonight with farro and salad on the side. So good and so easy! I’ve been wanting to make this for a while now and so glad I finally got around to it! Just made this…added sun dried tomatoes and calamata olives. Out of this world!!!!! I made this tonight and it was absolutely fantastic!!!!!!!!! I had to cook it a little differently because I’m terrified of my broiler. I’m in an apartment and the oven is probably older than I am. I simply cooked the whole thing on the stovetop in a skillet and it was perfection. My hubby loved it and he is super picky. This has become one of my staples. It’s just as good as it looks! I like a little more lemon though, so I squeeze lemon on the chicken before I season it in the pan, and after its cooked. Great recipe! Thanks! I didn’t expect something that seemed so simple to taste so good. I accidentally ate 2 servings. Oops! Is it dry? Or because or the marinade and the fact that it’s dark meat it stays some what moist? This was a delicious and very easy weeknight meal! I bought a bigger jar of artichokes in order to add more chicken to the dish and it worked perfectly. We had with quinoa which soaked up all the yummy juices. Is this chicken dish dry or juicy? Made this lady night, so easy and so delicious. Followed the recipe as directed. Thank you for this gem! This was delicious! It totally sold my mom on artichokes. This was delicious! I added halved grape tomatoes and it made a nice saucy liquid. I served it over rice, yum! Would the artichokes reheat well? Was thinking of using the leftovers for lunch meal prep. I did it as a meal prep and it reheated great! I made this last night. Five stars!! Whole chicken thighs were on sale this week so I boned them myself. It only took me about 5 minutes per thigh if that. But the pieces were irregular in size so some took quite a bit longer to get to 165 degrees at the thickest part. I confess to adding some chucks of sweet red pepper to the marinating chicken and artichokes to use up one I had. The pepper went well with the rest of the recipe and the added color was pretty. Don’t skip the squeeze of lemon to finish. That pulls all the flavors together. Thanks for a fabulous dinner, Gina. Hi, I couldn’t find the link to the video. Do you mind posting it again? You should be able to just click on the video picture. anyone try this in a pressure cooker? This was delicious, my only comment it took a little longer to cook. Definitely will be making it again. This is delicious and easy! A great weekday meal. Made this on Monday with bone in skinless thighs and boneless breasts. My husband and I like different parts. It’s so good! Definitely keeping this in the rotation. Thanks again Gina for another great recipe. In the video is that a cast iron skillet or is it an oven safe pan? Hi ! going to try this tonight ! If I was going to bake it instead of broil what temperate and time do you recommend? Thanks ! I’m confused, nothing new for me, lol — what do we do with the artichokes? eat them! I will share the video here. Hi! After the first 10 minutes do you remove the artichokes? Or do you simply turn the chicken & broil everything for an additional 10 minutes? Thanks for your help-this looks delicious! This was outstanding! Thank you! Made this tonight and it was awesome! Broiled 10 min on each side. How small are your thighs… I usually find mine are around 3-4oz which is around 150-200cal for the thigh alone. I baked in the oven and then broiled the last couple of minutes. how long did you bake and broil for? I have frozen artichokes. What can I marinate them (and the chicken) in? I imagine I could use something like an Italian marinade? Or make my own Greek marinade? Just made this – took a little longer to cook because my chicken thighs were bone in; and I didn’t have lemon, but it was delicious. We were just about ready to lick our plates at the end. Will definitely make this again! Other than missing the lemon, the only other change I made was to add 3 more cloves of garlic, we really love garlic on our chicken dishes. Fabulous recipe! Thank you, Gina! How big are the chicken thighs? P.s. I love all things skinnytaste…great recipes! Thank you so much! We made this a couple weeks ago and it was delicious! And definitely so easy.